Acquired: Acquired in trade with Montreal on July 29, 2018. Argos received Bomben and a fifth-round pick in the 2020 CFL draft in exchange for DB T.J. Heath and a third-round pick in the 2020 CFL Draft. 2018: Dressed for 12 games with the Argos, starting the final 11 at right guard. Played tight end in short-yardage situations in his Argo debut on August 2nd vs Ottawa. Started for the first time August 24th at Montreal. He caught one pass, a three-yard TD reception at Hamilton in the Labour Day Classic. He would be named an East Division All-Star for the fourth-consecutive year. Played the first six games of the season with the Alouettes. Traded from Hamilton to Montreal May 2, 2018 along with receiver Jamal Robinson, a negotiation list player and Hamilton’s first, fourth, and seventh round picks in the 2018 CFL Draft. In exchange, the Tiger Cats received Montreal’s first (first overall), fourth and sixth round picks in 2018, and their second-round pick in 2019. 2017: Played 18 games, started all 18 for Hamilton Tiger-Cats. Named East All-Star for third time. 2016: Played 18 games, started all 18 for the Tiger-Cats. Played in his 100th CFL game October 21st at Ottawa. Named Hamilton’s Outstanding Offensive Lineman. Named an East Division All-Star. Playoffs: Started the East Semi-Final against Hamilton. 2015: Played 12 games, started 11 with Hamilton. Had one catch for an eight-yard TD against Winnipeg. Missed end of regular season and playoff games with an injury. Named an East Division All-Star for the first time. Acquired by the Ticats prior to the CFL Draft for a first and third-round picks. 2014: Started all 18 games for Montreal. Recovered three fumbles. Playoffs: Started in both of Montreal’s playoff games. 2013: Played in 18 games. Playoffs: Played in East Final vs Hamilton. 2012: Played in 18 games. Recorded five catches for 33 yards. Caught his first CFL TD pass, a five yarder, against Edmonton October 28. Playoffs: Dressed in East Final loss to Toronto. 2011: Played two games. Caught three passes for 19 yards. Caught his first CFL pass against Toronto on July 15. 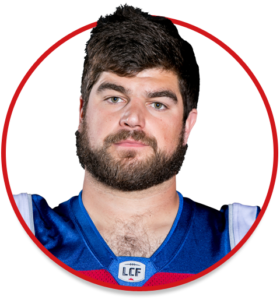 2010: Selected by the Montreal Alouettes in the fourth round, 31st overall, in the 2010 CFL Draft. College: Played four years with Guelph Gryphons. First Team OUA All-Star in 2009. Personal: Attended Assumption Catholic High School in Burlington, Ontario.